Church of Jesus Christ of Latter-day Saints, Record of Members Collection. CR 375 8, box 7701, folder 1, images 300-301; box 4166, folder 1, image 106. Church History Library, Salt Lake City, Utah. Kirchhoff, Milton. Marriage to Erma Schumann. 5 July 1922. Menomonee County. Michigan, Marriage Records, 1867-1952. “Kirchhoff, Milton B.” The Oshkosh Northwestern, 18 March 1961, 4. “Mary Martha Group to Assist Mobile Unit,” The Oshkosh Northwestern, 4 September 1953, 7. Milton B. Kirchhoff,” The Oshkosh Northwestern, 16 March 1961, 4. “Pace Opening Play in Golf League,” The Oshkosh Northwestern, 30 May 1958, 12. United States, Census. 1920, Wisconsin, Winnebago County, Oshkosh. United States, Census. 1930, Wisconsin, Winnebago County, Oshkosh. United States, Census. 1940, Wisconsin, Winnebago County, Oshkosh. Wisconsin, State Census, 1905. Database on-line at Ancestry.com. Originals at Wisconsin Historical Society, Madison, Wisconsin. Wisconsin, State Census, 1905, database on-line at Ancestry.com, originals at Wisconsin Historical Society, Madison, Wisconsin; United States, Census, 1900, 1910, 1920, 1930, 1940, Wisconsin, Winnebago County, Oshkosh; United States, Census, 1920, 1930, 1940, Connecticut, New London County, Waterford. James Grant Missionary Journal, 21, 22. James Grant Missionary Journal, 30, 33-34. James Grant Missionary Journal, 33-34. James Grant Missionary Journal, 48, 49. United States, Census, 1920, 1930, 1940, Wisconsin, Winnebago County, Oshkosh; Milton Kirchhoff marriage to Erma Schumann, 5 July 1922, Menomonee County, Michigan, Marriage Records, 1867-1952; “Milton B. Kirchhoff,” The Oshkosh Northwestern (Oshkosh, Wisconsin) 16 March 1961, 4. 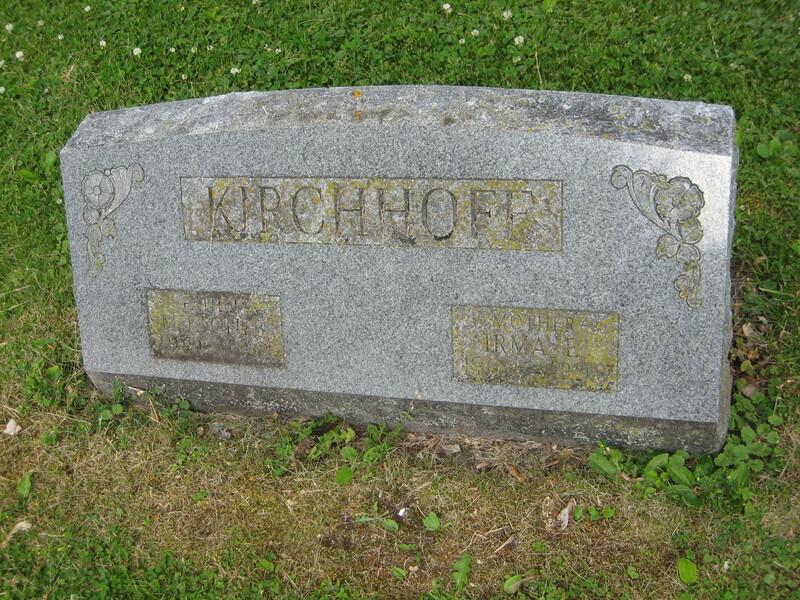 Milton Kirchhoff, Marriage to Erma Schumann, 5 July 1922, Menomonee County, Michigan, Marriage Records, 1867-1952; “Kirchhoff.” Presiding Bishopric stake and mission census, 1914-1935. CR 4 311. Church History Library, Church of Jesus Christ of Latter-day Saints, Salt Lake City, Utah. “Mary Martha Group to Assist Mobile Unit,” The Oshkosh Northwestern, 4 September 1953, 7; “Pace Opening Play in Golf League,” The Oshkosh Northwestern, 30 May 1958, 12; “Milton B. Kirchhoff,” The Oshkosh Northwestern, 16 March 1961, 4; “Kirchhoff, Milton B.” The Oshkosh Northwestern, 18 March 1961, 4.